Getting information on the film Unstrung has been harder than returning Andy Roddick's serve. The film, which was shot three years ago under the working title "The Zoo," followed junior players around on their road to Kalamazoo, yet I know of no junior tennis writers who have been given press kits or were invited to its Premiere at the Tribeca Film Festival. After my viewing as a paying customer last night I had to wonder if it was because any one involved in junior tennis would quickly pick up the film's inaccurate statements. This film is certainly not without its positive merits. I absolutely loved the way the film showed the dynamic of the personal lives of these boys and how it overshadowed their tennis. Of all the boys, I know little of Clancy Shields other than how he and his brother have led the Boise State team to an unbelieveable season. Who would have thought it was prefaced by living in a van for eight months to travel to tournaments? There wasn't much shockingly new about Donald Young or Marcus Fugate, though the audience seemed a bit surprised to find out what a "player" Marcus was -- and I don't mean on the court. I have followed the Seguso family for many years so I was not shocked by this family dynamic with two tennis-famous parents, but I did wonder why the film didn't mention there are also two more tennis-playing kids. I was absolutely enthralled by the Tim Neilly story. From his roots and re-visit to the Bahamas and the now defunct court he once played on, to his stuggles getting sponsors and helping his mom through her cancer, he is a player I wish I hadn't forgotten lately. And Greg Hirschman, a violin-playing, Republican-representing dedicated student who found the balance that led him to Stanford. Now for some of the inaccuracies... Marcus Fugate wins the Luxilon Cup and "rises to the top of the 18s rankings." There are no ranking points for the Luxilon Cup.... Tim Neilly wins the Orange Bowl and has "secured a top seed to Kalamazoo." With many more months of tennis to play, no one is seeding Kalamazoo after the Orange Bowl... Bruce Berque, Head Coach of the men's team at Michigan, is called a "Scout" in the film... The film finished with two more interesting pieces of information -- that Donald Young is at the bottom of the ATP rankings and has not won a professional tournament (he has) and Holden Seguso announcing that he has accepted a scholarship to UCLA (I have actually just confirmed this with Coach Billy Martin). I was ushered out of the theatre quickly. The man in front of me asked if there was a Q&A and the usher clearly said "No." I learned later that this was not the case. I would have liked to have been part of the Q&A with Rob Klug, however, I understand part of the discussion was on the fact that there are no tournaments for girls equal to Kalamazoo. As a long-time attendent of the Girls' 18 Nationals (where they also get a wildcard into the U.S. Open) I certainly would have argued that point. Mr. Klug did, however, acknowledge that Donald Young has won a professsional tournament since the film ended and that would be corrected. It will be interesting to see how they can correct that without dramatically changing the tone of the ending. First I must be clear that Unstrung is a documentary, directed by Rob Klug and the brainchild of Executive Producer Jim Courier. It has not been released to the general public beyond the week at the Tribeca Film Festival. 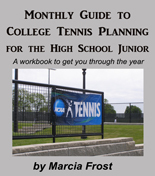 There is still time to correct the mistakes and turn this into a film Junior Tennis lovers will love. The question remains, though, will the general public love it? Rumor at the festival (again, I've given up getting information directly from the filmmakers) is that Disney has picked up the film for possible release. I guess we'll just have to wait and see if Unstrung becomes a Junior Tennis legend, or a portayal without full fact. I would love to see a copy of the former because despite its flaws I enjoyed watching the familar places and faces, as well as getting to know them a little better.